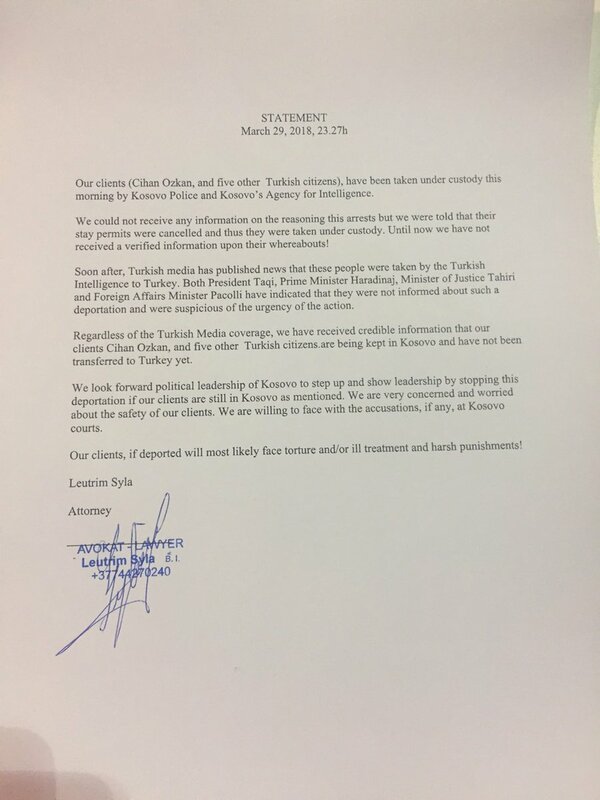 Lawyers representing six Turkish teachers who were arrested in Kosovo on Thursday, have released a written statement in which they confirmed that the teachers have not been deported to Turkey yet. Turkey’s state-run Anadolu news agency earlier reported that the Turkish educators were brought to Turkey in a joint operation by the Turkish and Kosova intelligence services. 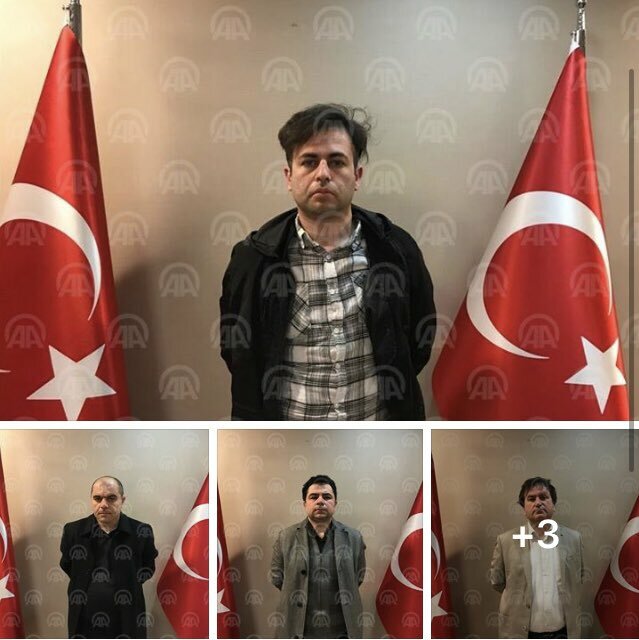 The agency also released the pictures of the teachers as a proof, yet the pictures turned out to be taken in Turkish Embassy in Pristina. 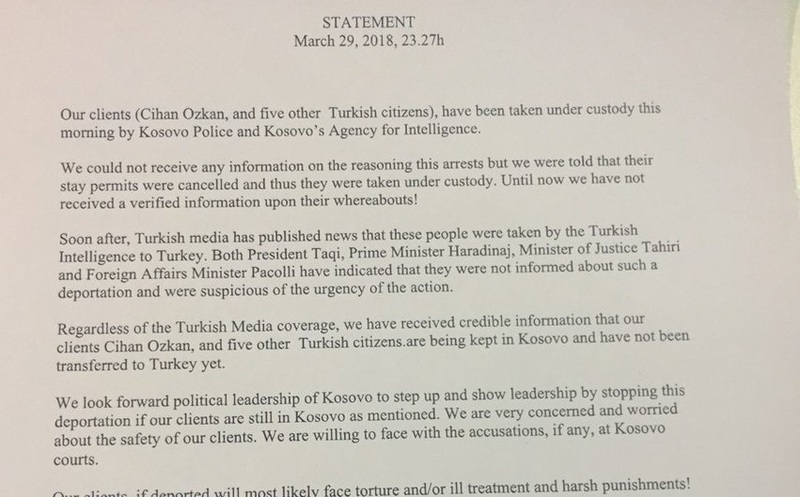 Kosovo police early arrested the Gülenists who used to work at a group of schools affiliated with the Gülen group, which is accused by Turkish President Recep Tayyip Erdoğan of masterminding a failed coup attempt in 2016. The Gülistan Educational Institutions operate four Mehmet Akif elementary and high schools in Kosovo. The schools were opened by Turkish entrepreneurs inspired by the views of Islamic cleric Fethullah Gülen. Months ago, Kosovo police arrested Uğur Toksoy, an educator with alleged links to the Gülen movement. 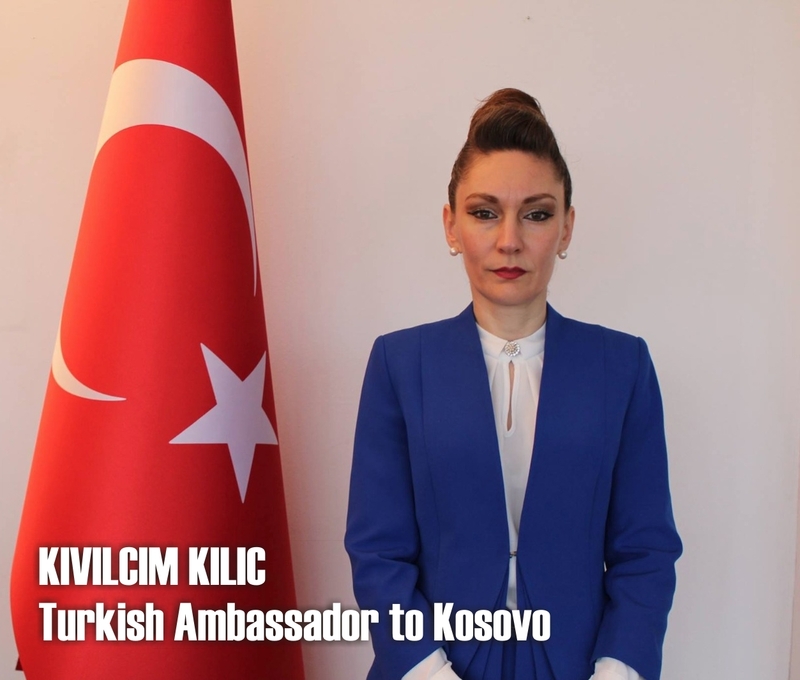 Kosovo has not extradited Toksoy to Turkey, but the ordeal still sent shock waves throughout Kosovo’s Turkish community, some of whom told the Balkan Investigative Reporting Network (BIRN) that they fled to Kosovo hoping to escape Turkey’s crackdown on the press and individuals and groups with ties to the Gülen group. In the aftermath of the coup attempt, the Turkish government launched a massive crackdown on Gülen followers and arrested more than 50,000 people from all walks of life on the pretext of an anti-coup fight. The government has also removed 150,000 people from state jobs due to their alleged links to the group.